Where have I been missing from Bangkok? Well, I have been catching up my lost weeks in Malaysia, relaxing and enjoying Malaysian food once more, nothing beats going out and deprive from your usual food to fully appreciate it again. It reminds me of the time I left my hometown and came to live in KL; that is when I start missing home food, Taiping-style food and appreciate it so much more every time I’m back in town. As for now, I went and visited all the food I miss since Bangkok. Don’t get me wrong though, Bangkok food is great, it excites my palate and I’m hooked to one or two of their dishes. But somehow, nothing beats home. For now, since its Christmas time, let this be a Christmas related post then (yes, it’s an excuse on my long overdue Bangkok food post). Yesterday, just for time of giving spirit, I cooked up some simple fare for J and I to enjoy together, thus escaping the hassle to go out, with the roads jammed with cars and the restaurants jammed with hungry people. I cooked a variation of fish curry, adapting from the trusted source Kuali, in order to fit what I had in the pantry (sounds familiar). The fish came out alright, though not as good as the Assam Fish I did before, but this one does have a lot more spicy kick with an extra personal touch to it. 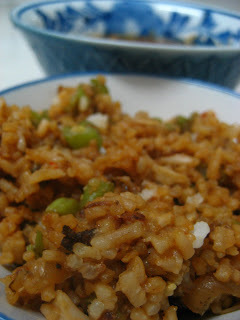 To accompany it, I came up with the idea of chow fan (fried rice) at the last moments. So it’s just a simple fare of chow fan with curry fish, enough to fill two happy tummies while enjoying the peace of home. 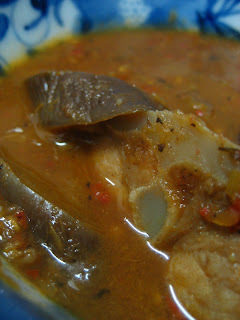 The fish turned with hidden spiciness, like how when you eat some dish, it was not spicy at first or two taste, but then when you continue on, you will feel the burning sensation in your mouth and then it is your tummy on fire. I must have put too much cili padi (bird’s eye chilli). Anyway, it was good, could have been better with okra but I did not get them during grocery shopping as they sold it in huge pack and it looks not-too-fresh. I would not be sharing the recipe as I believe it could be better, somehow lacking in something, this taught me not to mess with a recipe too much. As for the chow fan, I did it by my simple rules of ultimate chow fan. This time, it is much simpler as it would not be a main dish itself but just an accompaniment to my fish. So I just chopped up some shallots, fried it till slightly soft, throw in finely chopped long bean (my absolute favourite in chow fan, it gives the crunch and the nutrition I might add) and fry again for a minute. Then in went the rice, fry a little and pour in the sauce, which is a mixture of dark soy sauce, soya sauce, sesame oil, pepper and water. I added a little too much water this time, resulting in a less-than-perfect chow fan which was bit sticky. For extra seasoning, I splash some fish sauce and rice wine vinegar. Then of course, an ultimate chow fan must end with egg coating, to seal up the goodness and turn up the taste a notch. Oh if you have notice, there is no garlic in present, yes I ran out of it, but I believe with it, it would have been so much more fragrant. So there, it wraps up my Christmas dinner for two. Now on you go to enjoy your holidays, while I see would I be able to squeeze in some last minute baking and also, not to forget my Bangkok food posts to come! Cheers!